Around the world sharks are in big trouble. Some shark species have declined by over 90% due to fishing, shark fining and shark mitigation strategies. Few know, often blinded by misguided fears, of the shark's current struggles and the impact this could have on human life. Sharks are quickly headed for extinction. A number of scientific studies have demonstrated that the depletion of sharks results in the loss of commercially important fish and shellfish species down the food chain, including key fisheries such as tuna that maintain the health of coral reefs. As important apex predators, sharks have shaped marine life in the oceans for over 450 million years and are essential to the health of our oceans, and ultimately to the survival of humankind. Sharks ensure our very survival. The frightening reality is, like them or not, sharks play a crucial role on this planet. Remove sharks from the oceans and we are tampering with our primary food, water and air sources. Sharks keep our largest and most important ecosystem healthy. Our existence, in part, is dependent upon theirs. Sharks have sat atop the oceans’ food chain, keeping our seas healthy for over 450 million years. They are a critical component in an ecosystem that provides 1/3 of our world with food, produces more oxygen than all the rainforests combined, removes half of the atmosphere’s anthropogenic carbon dioxide (greenhouse gas), and controls our planet’s temperature and weather. As the apex predators of the oceans, the role of sharks is to keep other marine life in healthy balance and to regulate the oceans. Studies are already indicating that regional elimination of sharks can cause disastrous effects including the collapse of fisheries and the death of coral reefs. One study in Belize has shown reef systems falling into extreme decline when sharks have been overfished, destroying an entire ecosystem. The downstream effects are frightening: the spike in grouper population (thanks to the elimination of sharks) resulted in a decimation of the parrotfish population, who could no longer perform their important role: keeping the coral algae-free and therefore reducing the oxygen quantities in our atmosphere. The knock on effects of this could be devastating for all life on Earth. We don't hear how the elimination of sharks might impact our best natural defense against global warming. Or how our favorite foods might disappear as a side effect of the extinction of sharks. Or that we could lose more oxygen than is produced by all the trees and jungles in the world combined if we lose our sharks. But we should. "Sharks face a unique threat unlike any other fish. humans need healthy oceans. " There are more than 465 known species of sharks living in our oceans today. Thirty one of these call the Gulf waters home. Yaryoor is Arabic for Shark. In September 2014 UAE’s Ministry of Environment and Water enforced ministerial decree no. 500 to regulate the fishing and trading of sharks. Fishing has to be limited to waters that are not less than five nautical miles from the country’s shoreline and three nautical miles from the country’s islands. Shark fishing is only permitted from July 1 to end of January the following year. Shark finning was declared illegal in 2011 in the UAE. Shark finning is the process of finning sharks aboard boats and tossing their bodies back to the water. Sharks have to be brought to the landing site in one piece; no tossing bleeding carcasses of sharks back into the ocean. 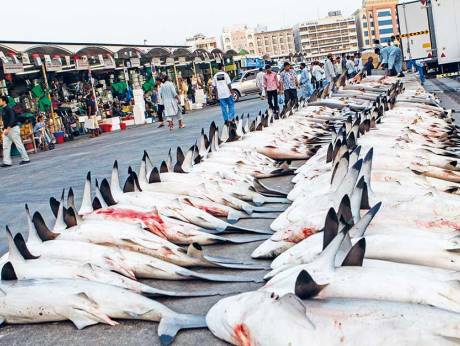 Fins sell for Dh 150 – Dh 300 a kilo but are sold for a much higher price in the Far East, where one large fin can fetch up to Dh 4,700. Yaryoor – Arabic for Shark. Whale Sharks can not be legally commercially harvested, in keeping with CITES. The Spot-Tail Shark, Milk Shark and the Blacktip Shark are amoung the top three populous sharks in the Persian/Arabian Gulf. With the exception of the Blacktip Shark, the dominant species in the UAE are relatively small sharks that commonly form large schools in inshore waters. While little information is available on whether larger sharks were more common at one time, fishermen have stated that the size of sharks in the Gulf has greatly diminished (Jabado et al. 2014). As such, it is possible that many larger species have been overfished to some extent, and that the fishery is now reliant on smaller sharks that are dominant in landings. Our campaign manager, Natalie Banks has been involved in ocean conservation for over eleven years, and became well known in the shark conservation circles when she rallied against lethal shark control measures in Western Australia in 2014. This led to Natalie forming a registered charity in Australia called No Shark Cull. Since then, she has worked with federal, state and local governments in Australia to provide advice, research data and even undertaking shark spotting trials. Natalie is also the Chief Adviser for Sea Shepherd Australia regarding its shark campaigns. For further information head to her website. Don't buy or consume shark products. Oppose restaurants and shops that sell shark products.